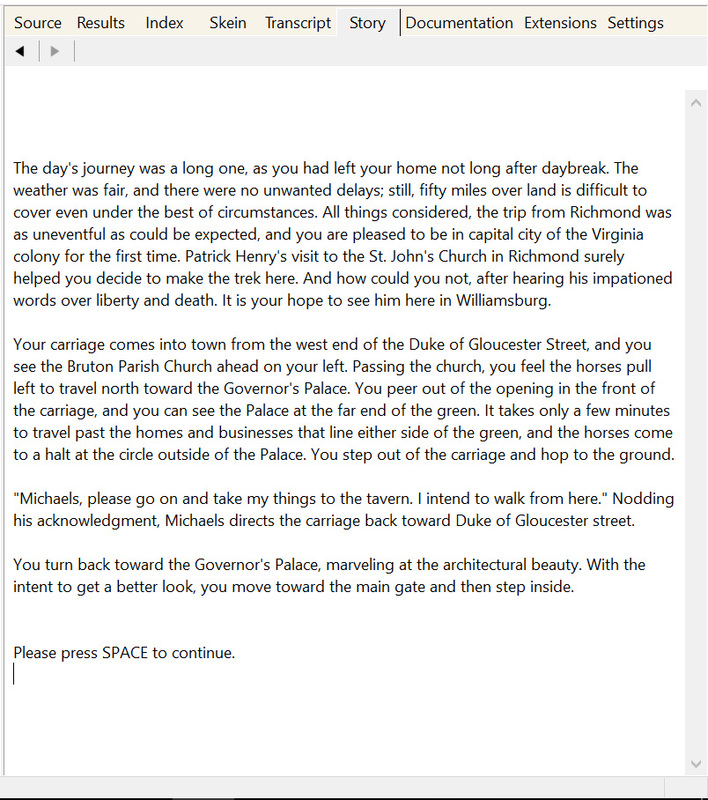 Interested in getting started with Interactive Fiction? If so, this primer by Andrew Plotkin will give you an introduction. The handy-dandy reference card is especially helpful. Progress on the Historical Williamsburg Living Narrative continues. 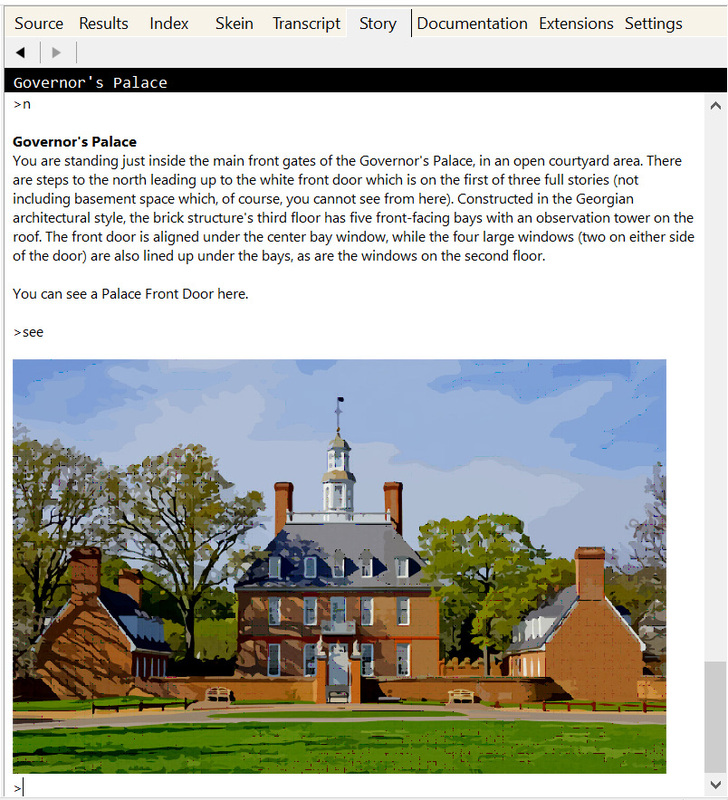 Three plot-level releases are planned: a walk-through version focused on the Williamsburg physical layout, an exploratory version including interaction and discovery with historical characters, and narrative version that is constructed around the removal of the gunpowder supply from the magazine. The following two screenshots represent what the player will first encounter regardless of the version of the game being played. First is the pre-game opening screen that appears before the player provides any input. As you can see, it sets up a little bit of the story framework by providing some background on the player character and context on how he comes to be in Williamsburg. The second screenshot depicts the description the player gets the second time this location is visited. (The first version of the description has some additional information and is displayed as soon as the player presses the Space bar at the intro screen.) As you can see, the command “see” was entered after the text description. The way the HWLN game is being implemented, graphic images will be provided at many locations; however, in order to display the images, the player must enter the “see” command at the prompt. The images themselves are based on my actual photography of Williamsburg. While I’m doing Glulxe testing, I thought I’d take one more screen shot of the game, this one all text. This is right after the game intro screen comes up, and the player presses the space bar to get into the game proper. You’ll notice the first command issued by the player is followed by more descriptive text. “More” is a custom command I’ve added to the system that displays more detailed information about the location surroundings. Ultimately, it’s all to help the player make sense of the game. It’s quite easy to release Inform 7 games for the Glulxe interpreter, which in turn makes it easy to test. So that’s what I did to get this screen shot with the Capitol, and there’s a portion of descriptive text on the screen as well.